Even though I have been baking a daily batch of muffins for Nolan in the past few months, I have not made a dessert since his birthday cupcakes over a month ago, and the open can of pumpkin in the refrigerator told me last night that it was time. I wanted something quick and easy, delicious and appealing for the entire family’s tastes, and preferably egg-free in order to stretch our remaining eggs for breakfasts for one more week. What came to mind was a variant of my childhood favorite cookie, moist cakey chocolate-studded pumpkin cookies. My mom’s recipe is studded with slivered almonds, but I made mine with a base of almond flour. The addition of arrowroot helps manage the moisture content of the pumpkin, and additionally serves in a binding capacity (along with psyllium powder) to eliminate the need for eggs. These cookies fit the bill perfectly for an after-dinner sweet on a rainy spring evening, and (shhh!) they aren’t too shabby alongside a breakfast smoothie on a rainy spring morning either! These cookies are moist coming out of the oven and become even moister by the next day. They also don’t spread much, so if you want flat cookies instead of mounds, flatten the dough before it goes in the oven, or tap the tops of the cookies with the spatula when they first come out of the oven. Preheat oven to 350F (325F for convection). Combine pumpkin, sour cream, honey and sucanat in a medium bowl. Stir in remaining ingredients to form a thick batter. Dish by 2-tablespoon mounds onto a prepared cookie sheet. Bake for about 15 minutes, until set but still moist. Makes about 21 cookies. Variants: This recipe was adapted from a pumpkin snickerdoodle recipe and could easily be converted back by rolling scoops of dough in a mixture of cinnamon and coconut sugar or sucanat before baking. Substitutes: You could likely substitute tapioca starch for the arrowroot, and use either all honey or all sucanat. 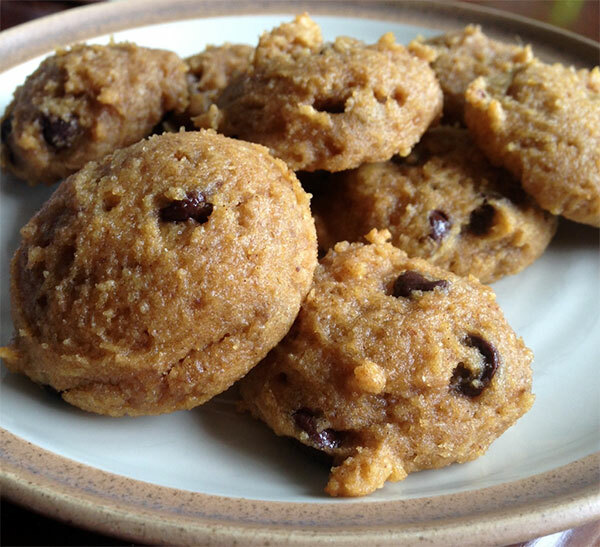 These could also become a more traditionally flavored snickerdoodle by substituting mashed banana or applesauce for the pumpkin, limiting the spices to cinnamon, and omitting the chocolate chips. I suspect these would also be delicious with currants in place of chocolate chips, but Nolan would never go for that version! Source: Freely adapted from Tess Domestic Diva.